Fractional shares can make investing accessible to everyone, especially people who don’t have the funds to satisfy hefty account minimums. When you first set out to create your investment portfolio, don’t be surprised if you discover you have to save up some money just to open an account. Most account minimums are north of $2,000, some as high as $20,000 or even more. With these high account minimums, many people have found other creative ways to invest in companies. Save and get started quickly, because if you wait too long, you could lose out on the benefits of compounding that can only be fully reaped with time. Even if there are no account minimums, the share prices can leave you feeling hopeless, as you quickly realize that only one stock share can cost hundreds (or even thousands) of dollars. 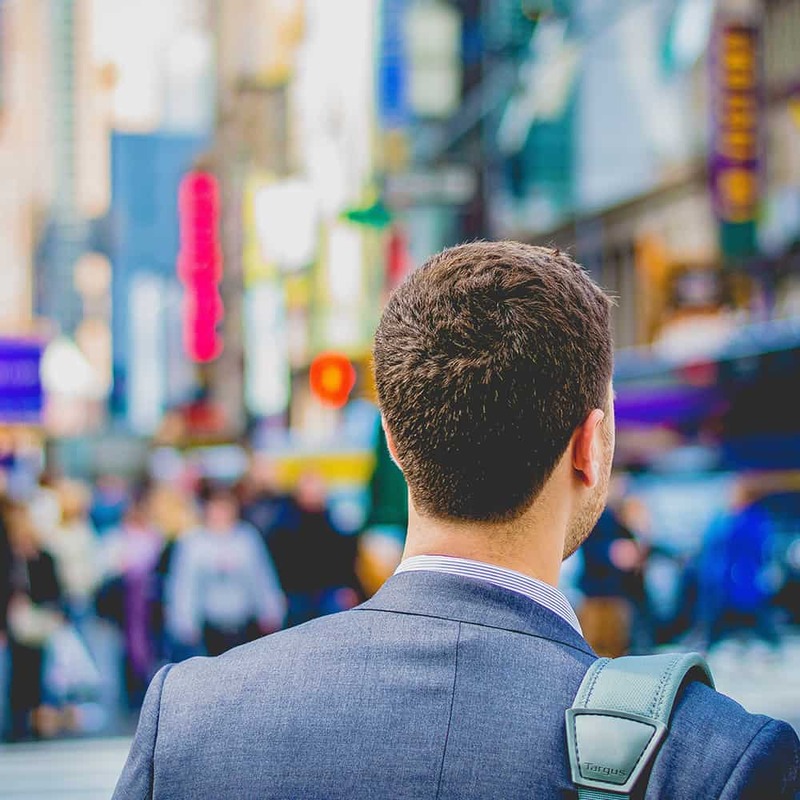 Whether you are a college student, a recent college graduate, or an employee who is successfully moving up the corporate ladder, you still need enough money to cover your basic expenses before you start making regular investments. There are several different ways to get started investing, so be sure to explore all of your options. If you just want to dive in, our #1 recommendation for buying fractional shares is M1 Finance. It's commission free investing that allows you to buy fractional shares. Check out M1 here. What Is Fractional Share Investing? How do you invest regularly when it costs so much to open an account or buy shares? Fear not, this is where fractional shares come into the picture. 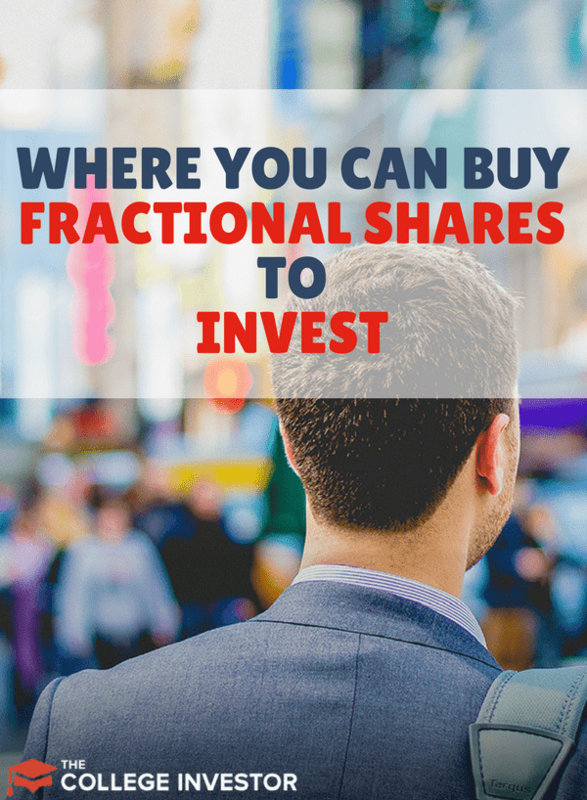 Fractional shares allow you to buy fractions of a whole share, just as the name suggests. You can even purchase enough to invest just $30 per week! While some of the platforms still have account minimums, fractional shares can help you reach your goals faster than investing in whole shares. Let’s take a closer look at how fractional shares work. How Can You Benefit From Fractional Shares? More importantly, you can immediately start using all cash available for investing because you no longer have to wait and save up the minimum funds needed to open an account. As a result, you get access to shares you may not have otherwise been able to afford. Surprisingly, you could still end up with fractional shares due to stock splits and dividend reinvestment plans, even if you only trade stocks in whole shares. First, you set the dollar amount or amount of shares you wish to purchase. Next, the platform will calculate the amount of shares or dollar amount needed to meet that number of shares, regardless of whether it is a fraction. Investors can leverage the benefits of trading fractional shares by getting access to stocks that they normally would not be able to afford if they were forced to purchase whole shares. If you’re on a budget and want to limit the amount spent on a trade, fractional shares can help you buy high priced stocks such as Priceline (PCLN) with shares traded between $1,148.06 and $1,927.13 per share in the past year. Fractional shares can be advantageous when you don’t want to spend a lot of money on a trade, but wish to purchase a stock that has a higher price per share. Since you control the amount you spend, fractional shares allow you to put all of your available cash into the market immediately- no need to wait until you raise enough cash to meet the account minimum or enough funds to buy one share. If you don't invest with fractional shares, you'll end up with random amounts of left over cash just sitting in your account going to "waste". This is a huge plus for those of you that don’t like to do math- you don’t have to calculate how many fractional shares of a stock or exchange-traded fund (ETF) you want to buy or sell. All you have to do is input the dollar amount for each trade or the share amount, and the calculations will be made to meet your goal! Most fractional shares are eligible for dividends just like full shares. Since you are able to make regular investments that meet your budget, it will be easier to invest on a regular basis for the amount you choose. Fractional shares are growing in popularity, and with new apps and companies that provide an investment plan for any budget, you will be confidently investing in your portfolio in no time. M1 Finance is our favorite place to buy fractional shares to invest because they offer FREE investing! Yes, you read that right - commission-free investing. Plus, if you have a certain allocation you're going for, it will buy shares to help you maintain the proper allocation. Check out M1 Finance here, or read our full M1 Finance review here. Betterment is a company that offers fractional shares of ETFs invested into a curated portfolio. Betterment allows you to invest in thousands of companies across the world with minimal risk. The SRI (Socially Responsible Investing) portfolio, Goldman Sachs Smart Beta portfolio, and the BlackRock Target Income portfolio. The SRI portfolio allows you to invest based on your values while keeping fees low. Investors who select Betterment’s Goldman Sachs Smart Beta portfolios can use Goldman’s ActiveBeta™ equity and Access Fixed Income funds. The BlackRock Target Income portfolios are based on bonds and designed for investors who are looking for a low risk portfolio with steady income. Betterment also has a Smart Saver account that lets you earn much higher interest than a regular savings account. Check out Betterment here, or read our full Betterment review here. Motif is catered to people wishing to implement certain strategies in their portfolio such as biotech, interest rate plays, military contractors, etc. Motif can be a great option for someone looking for a portfolio limited to 30 stocks. Motif will help you create a portfolio that reflects your goals and value with low-cost and value-based investments. All you have to do is answer some questions to get a customized portfolio to meet your goals. Like Betterment, the platform will remove companies that do not align with your values and instead match you with companies that promote a sustainable planet, fair value, or good corporate behavior. Fractional shares in Motif Investing accounts are eligible for dividends, just like full shares. You can also trade up to 30 stocks in a single click. By investing directly into individual companies, you cut out hidden fees, including management fees. Unlike pooled investments such as mutual funds and exchange-traded funds (ETF), when you invest through Motif, you buy and own the underlying stocks so you always know exactly what you own. Stash is a popular option for investors looking for accounts with low minimums and expert guidance. With Stash, you can invest in a curated selection of exchange-traded funds (ETF's) or purchase fractional shares of stocks through a mobile platform. Stash provides some personalized investment recommendations based on your responses to several questions. Their fees are reasonable, at $1 per month for accounts under $5,000, and an annual fee of 0.25% for accounts over $5,000. You can choose from a selection of ETFs preselected by their financial experts. Stash also provides educational content tailored to your unique investing profile. For convenience, you also have the option to set up automatic investments to your portfolio. Companies like Stash can buy one share and split it into fractional shares, and you can get started and own a fraction of a share for just $5. Read our full Stash Investing review here. Stockpile lets you buy fractional shares and start trading at 99 cents per trade. There are no monthly fees or minimums. You can choose fractional shares of more than 1000 stocks and ETFs. At Stockpile, you can buy stock using a credit card, debit card, or even PayPal, and dividends are reinvested free of charge. Like Stash, all it takes is $5 to get started. Stockpile is also a great way to give gifts of stock to children. Check out Stockpile here. Before you begin investing with fractional shares, learn the basics and read up on best practices in building your portfolio. We have put together a list of the best investing blogs and investing podcasts to follow, as well as ways to learn about investing when you are just starting out. Now that you’ve learned the benefits of fractional shares, how will you put more of your money to work? Have you ever bought or sold fractional shares? If so, we’d love to hear about your experience in the comments section below. I came across your site when I was forced to move an IRA account to another company. The company that moved the IRA no longer offered the ability to buy fractional shares inside your IRA. Do you know of any company’s that allow you to buy fractional shares inside an IRA? I have been using Sharebuilder to buy fractional shares for about 10 years and loved them. But they just got bought out by Etrade so will no longer offer this. I am thinking about stockpile what do you think is the best one? Is there any way or any apps like these ones that let you use stop-loss orders? I believe Stash doesn’t do that, but are there any other investing apps or brokerages that allow you to buy fractional shares and use stop-loss orders? With fractional share investing, you won’t see a stop loss order option. The reason is the brokerage themselves buys a full share, and divides it up amongst their customers. They typically buy that share/shares at a certain time each day. So, there isn’t a true stop loss ability for fractional share investing. Even at large brokers, if you have fractional shares (say, due to dividend reinvestment), if you have a stop loss, the full shares will be executed at that price, but the fractional shares typically settle up a day or two later. I am brazilian and started investing in USA market buying some shares. I have a quick question about the dividends. If I bought a share and that share pays dividends, do I recieve the proportional dividend? Or not? And, in your opinion, is a good idea investing in a share fractionally? Yes, you would get your small fraction of the dividend.